Last week I spent some time cleaning out my sewing room stash (selling a few items, gathering others for donations, etc.) and came across this fat quarter bundle that I purchased several years ago. 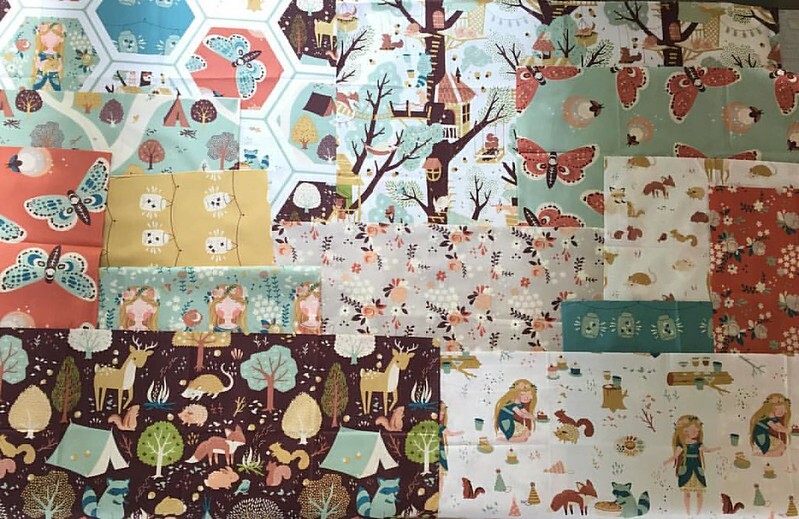 It is Fort Firefly by Birch fabrics. I still simply adore everything about this collection! The colors, prints, fireflies! It is one of my all time favorite collections for sure. Then I came up with the name Golden Brick Road to Fort Firefly, and yes my husband is correct that it is probably the longest quilt name ever, but it just fits. In my effort to get this done as quickly as possible (and back to the other WIPS I had currently been working on…OOPS!) I decided to do a loopy meander free motion quilting design using Aurifil 50 wt. #2132 “Tarnished Gold” which was the perfect shade to match the sashing and backing fabric. 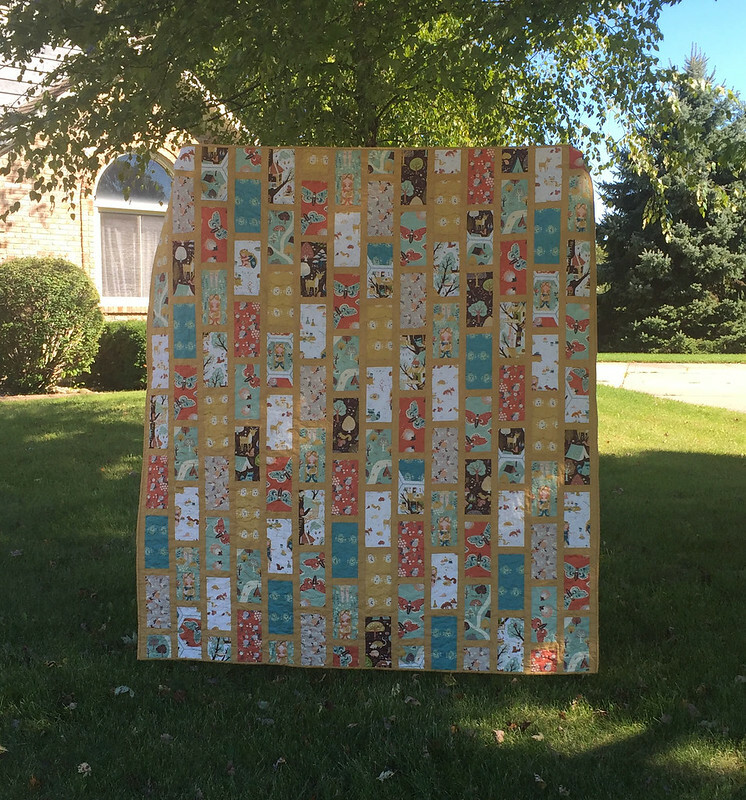 A Sunday afternoon spent watching football games and this quilt was bound 🙂 The quilt finished at 64″ x 72″, the perfect throw size for my son and I to snuggle under on the couch. If you’d like to make a similar quilt, below are the details. You will need 13 fat quarters and 1 3/4 yards sashing fabric to make this size. Cut each FQ into ten 4″ x 8″ rectangles as shown above. I know this is a funny cut size, but this is what worked best to showcase these prints and there was little waste after cutting, so you basically use up the entire fat quarter. Since I had 13 FQs, that gave me 130 rectangle bricks. Lay the rectangles bricks out into 14 “columns” of 9 bricks each, spreading out each print and color so that it seems balanced. This will use a total of 126 bricks. 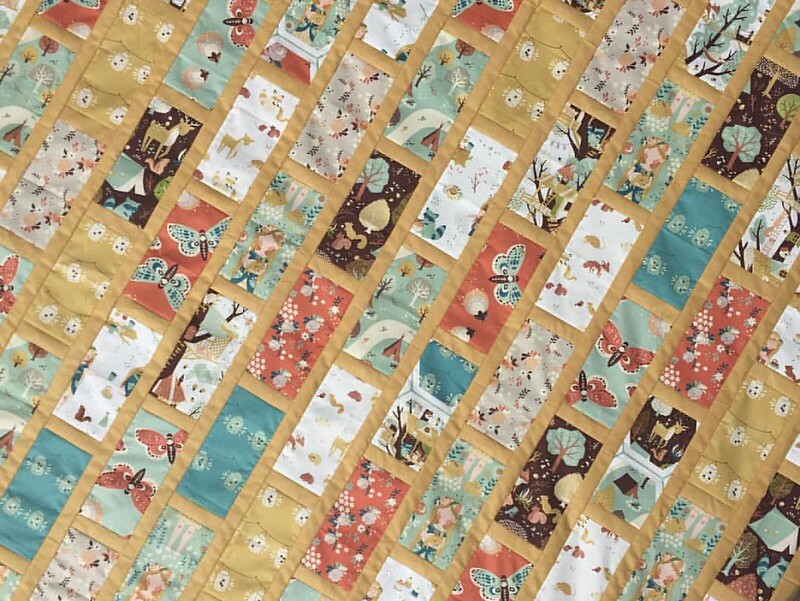 If you have more fat quarters, you can make your columns longer or add more of them to the width to suit your needs. To get the staggered look, you will need to cut the BOTTOM brick in each odd numbered column down to 3 3/4″ x 4″ (so columns, 1, 3, 5, 7, 9, 11, 13) and then cut the TOP brick down to 3 3/4″ x 4″ in each even numbered column (columns 2, 4, 6, 8, 10, 12, 14). This will make sure that your sashing will hit in the middle of the bricks in the columns next to each other. Cut eleven 1 1/2″ x width of fabric strips from your sashing. Sub-cut into 112 – 1 1/2″ x 4″ rectangles. Lay these sashing rectangles between the bricks in each column. Sew together each column of bricks and sashing rectangles, pressing your seams open. Cut thirty 1 1/2″ x width of fabric strips from your sashing fabric. Piece together in sets of two strips each and trim to match the length of your columns. Sew the pieced sashing strips onto the right side of each column. Column no. 1 will get sashing on both the left and right sides. Sew sashed columns together into the quilt top and you are done! You always amaze me Mandy! Awesome quilt. Thank you for sharing the pattern! Wow – how beautiful. I have a dragon fly layer cake and charm pack i have not used. this would be a great way to use those! Just what I’ve been looking for–at the moment. Thank you so much!! This is such a lovely quilt. Love the fabrics and the choice of your sashing fabric is just perfect. My kind of quilt. Thanks for the tutorial! 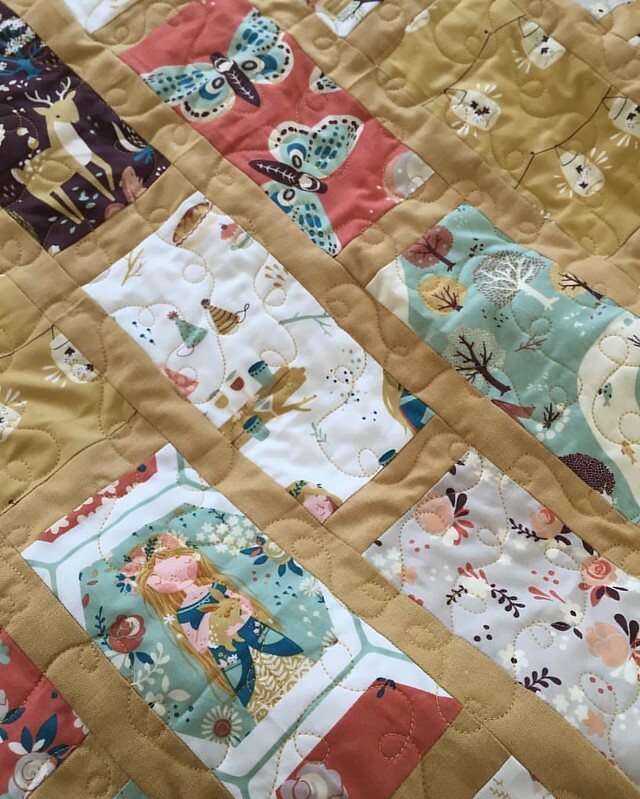 Hello, I love this quilt by Material Girl Quilts. The name of the quilt is so cool, Golden Brick road to Fort Firefly. I want to make this quilt. I like how the fabric is featured in brick style!